A Beka Academy is an accredited distance learning program for Kindergarten through grade 12. Christian character building textbooks from A Beka Book are used with video instruction for a college preparatory education. A Beka Academy offers a variety of educational options to include: Accredited Programs, Independent Study, Traditional Programs and individual courses. Students may use DVD’s for instruction, Video Streaming and live hook-ups for learning. A Beka Academy offers an ESL program for international students. Pros: There are no pros!!! Cons: Customer service is almost as bad as their curriculum. I am a single father of a 14 year old and serve in the military. I was deployed overseas (noncombat) and able to take my son. I did not want put him into schools and pull him as he was just getting settled again and again. He attended school as like every other child until 8th grade, when I had to deploy overseas for the military and took him with me. I checked Army resources and Abeka was touted as being a successful program of instruction that would fit our needs. After speaking with their customer service/enrollment personnel, I was assured that they work with military families in these circumstances “all the time” and that I “would have no issues with the curriculum.” This proved untrue. We were sent the DVDs and books and my son jumped into them eagerly. He finished overseas and very quickly and then the trouble began. I contacted Abeka asking for the labels to return the DVDs and self-addressed envelopes to return the coursework. After stating over and over again they would send them… they never arrived. I held the work and continued to contact them many, many, many times. Instead of sending us the resources to return their coursework for grading they would send emails stating that my son had not returned the work and was out on the “inactive” status. When I would again call, I was informed “it was a mistake” and they would “reactivate” his account standing. This of course was then immediately followed by yet another email stating he was immediately inactive again. It was frustrating to say the least, as my son had completed everything easily and did more studies involving international entities just to fill out his education. We left our overseas deployment and returned to the States where I continued to attempt to return the completed coursework. In a short time, we were sent overseas again. I expressed the urgency in returning the work so I could order the next year (9th grade). Abeka, of course, stated they would be happy to take my money and send more material. I declined stating that I wanted to ensure my son received credit for the work he completed and then I would order the next year (9th). Once again, Abeka promised to send the material before we left the States. This simple act seemed to be an impossibility for the company as a whole. I asked multiple times if I could send in the material without their envelopes and was informed they would arrive, just be patient. We deployed yet again without sending in the work. After many months, we returned to find the envelopes had arrived after we had left the country. My neighbors on post held the package for our return. I called and was informed again that my son was “inactive”. They reactivated him and within 30 minutes received an email stating he was inactive again. I was furious! I called and spoke to a Mr. Webb who informed me that he would” take care of everything” and apologized profusely. After I settled, I bought into the whole” I am a supervisor and I promise to correct all issues for you.” I asked what was needed to be sent in with the books and DVDs and was informed that sending in these materials was enough. I sent in the work and was stupid enough to order the 9th grade curriculum for my son to complete very quickly. Abeka had no issue taking my money immediately. They did however have big issues with grading my son’s work. I was informed that they would not send the 9th grade curriculum because they had not graded his 8th grade yet. Next, I was informed that my son could not complete the course at his pace quickly and would if he completed his work early they would actually hold it up to 6 months before even looking at it. Next, they stated that I did not send a progress report, even though I was informed it was not needed by a supervisor, and last they stated the work was not complete even though every single page had been checked, verified and graded by me. Being a senior non-commissioned officer and holding every instructor certification in the military along with have a graduate degree and post graduate studies, I assumed that I actually was able to impact my son’s education in a positive way by being proactive and creating a love of learning that I hoped would last a lifetime. I spoke to Abeka yesterday. I informed them that I wanted my refund for the 9th grade curriculum that they had not sent. I also informed them that I was very disappointed in their program and would inform anyone who asked me of my experiences with them. In my honest opinion, I would look elsewhere for an educational curriculum that actually has the best interests of your child at heart. Abeka does not assist military families in any way, no matter what they promise. They do not care for the education of your child. Their curriculum is tedious and dry at best. Consider this an honest assessment and look elsewhere for an education opportunity that will ignite your child’s interest and love of learning. My son is frustrated as we believed that he would be ahead of his peers and now he is behind. I am desperately looking for an opportunity to assist him in catching up on his 9th grade credits and getting ahead. I have to deploy to a combat zone in 2 months and my concern is getting my son caught up before I leave. Any and all suggestions would be appreciated. I have used a beka for two students for 3 years now, grades 1-6th. We’ve done a year of just books and then switched to independent learning via a beka academy. I love it. Yes, they sometimes complain about the length of the videos but they sing along with them and play games as well. They learn songs that help them memorize all kinds of valuable info. There is a lot of seat work but you have the option to assign all of it, some of it or none of it. My oldest began to really love math after hating it for years. The man who teaches only math, is funny. She looks forward to math with him. I see many people complaining about verbiage used and lack of critical thinking being taught but I just don’t agree. I don’t expect a curriculum to be my kids’ only learning experience. My husband is a member of the Mi’kmaq nation and he is also a public high school teacher, he has no problem with the verbiage used. I read another review that said that the a beka history books are wrong and what I’ve actually experienced is that modern history books have re-written history to suit today’s political climate. History and science are factual subjects that sometimes today are written from one point of view or another. What I like about a beka is that their text books are straight forward and don’t involve politics. Pros: Takes very little time, perfect for busy families. Very great website for students with recent grades, a checklist, and a list of quizzes and tests for the entire year. Can call the Abeka office for help with any subject in any grade. Cons: Digital testing doesn't work out very well. I am halfway through my first high school semester and I think that this program is great for me. I love having the freedom to watch the videos at my own pace, work ahead, and rewatch lessons whenever I need to. The only thing I would not suggest is digital testing. Especially if you cannot spell very well since it will only count a correct answer with one letter off as half credit, and they count it wrong with more than one. It is very organized, and if I understand the review in the lesson, I can skip to the actual lesson. The textbooks are very easy to read and colorful, so you can take excellent notes and know what is important. The website is great, too, because you can see what you have to do everyday, see what quizzes and tests you have, there is a daily checklist, you can see recent grades, and you can see every assignment for the entire year. When I get stuck on a math problem I don’t understand, I can simply call Abeka and they will help me understand the problem, even showing me it on a Skype-like white board, and they do it for any subject in any grade. I have 5 classes a day, at 30-45 minutes per class, and you have less than 15 minutes of work after each class that you can easily complete during the next classes review. I have less than 4 hours of work per day, which fits my busy schedule perfectly. Most people says it takes forever or it’s really hard, but for me it’s exactly opposite. I would suggest Abeka Academy for anyone. My daughter has used Abeka curriculum her entire academic life. Her Christian school used it and when she started homeschooling in the forth grade we continued using it. We love it because it is thorough. She uses the DVDs and she can back them up if she needs to if she missed something. She has learned to take notes, how to master material and organize her own time. I feel she will be well prepared for college. I love this curriculum but wish that we could buy subjects separately for elementary. Also, the arithmetic video is too long at 40 mins. Ideally the lesson could be taught, speed drills done, some problems worked out….all in a concise 20 mins. My first grader really dislikes the math section bc it’s so long. Cons: Grading is extremely stringent. Spell a word wrong and only get half credit for an answer. Also a couple of times she received zero credit on an essay that she felt good about. After a friend’s recommendation my 9th grade daughter just finished her first semester using Abeka Academy’s accredited program and she watches her classes on DVD’s. She spent her first 9 years at a local Christian School. We have been extremely pleased with the program. It is really tailor made for someone like her – highly responsible and tired of the distractions of a very active class. The best part is the teachers are fantastic (her favorites are Physical Science and Bible) and the program is highly organized and efficient. We feel she is getting an excellent education for a fraction of the cost we were paying before. If we have questions Abeka is quick to get back to us. It has been since the fourth grade that I have seen my daughter this happy at “school”. She loves organizing her own day. Highly recommend. I hope a homeschool dad is allowed to post here, since this seems to be a site only for homeschool moms. I used aBeka materials when I was in school. I have had several nieces and nephews homeschooled through aBeka’s video program. We are currently homeschooling our two children, using some of aBeka’s books. About the videos, they can be helpful, but aBeka does seem to be too inflexible about things. You cannot order individual subjects in elementary school, and they will not even allow you to substitutute one grade subject for another. For example, if your child is in second grade and is currently using third grade science, you must order all thrid grade subjects for the video program the next year. You cannot substitute fourth grade science. This greatly limits the individual aspect of homeschooling and the flexibility to meet the needs of each child. The videos themselves are okay, but can tend to get boring to sit and watch all day. aBeka curriculum is okay, but there are other programs, like Bob Jones, that do seem to put the child first and allow flexibility by substituting different grade level subjects when ordering their videos. I am in 9th grade now i really do like most of my classes except for physical science and algebra.Mr.smith is great but i dont like that i dont have a history in 9th,the work load is more than most but the flexiblity is great. Sometimes the classes do get very boring,the test reviews are wonderful,the classws could be shorter. A Beka Academy Review by Dena R.
As a current student of a beka academy, I would just like to share my experiences so far. I’m doing the accredited video streaming. The videos are quite outdated and aren’t very interesting in my opinion. In some classes, you have to watch at least 10 minutes of a silent classroom where the teacher is just walking around while the students are doing work. In the other classes, however, at least 70% of the video is reviewing what you’ve learned and for me, that 70% is extremely unnecessary since its quite easy for me to pick up the things they teach. And also, there’s no way to skip those parts, so what should be a 15 minute video (without all the review) it’s close to 45 minutes for each lesson (6 lessons total per day). I honestly don’t even watch the history or science videos because it makes it 10x more confusing to me because the teachers like to put things in their own words instead of teaching directly from the book. I just read directly from the book – I mean, they only test you from the book anyways, not all the unnecessary teachings and stories that are in the videos. Parents seem to think too that this is a “better than average education” and I partially agree. For me, a lot of it is stuff I’ve already learned, the rest of it isn’t much different from any other school. It’s not a horrible school, but its not my favorite. It is horrible. yah sure its organized, but they have random pop quizzes about things they learned and already tested on, instead of what they just learned. the digital assessments disappeared. my daughter was all caught up and on lesson 24 now all her digital assessments are on lesson 10 and 15 when she already took them. videos are boring and the teacher walks around helping students and she cant raise her hand to get help. the curriculum is organized but there is so much homework and random tests. she wants to go back to public school and deal with the bullies. We did the parent led Abeka last year and it went really well. This year we opted to do the accredited streaming curriculum and have found it to be very flawed. There are many improvements needed including the ability for parents to check off videos in order to skip. At the end of lessons the teacher is walking around the room helping and encouraging the kids, why do we HAVE to watch hat without the option of ending it there and starting a new lesson. Also the video where you have to watch the seatwork… it’s equivalent busy work that I wanted to avoid in public school. Abeka needs to take away this unneeded restriction. I can’t tell you how many times I’ve seen complaints on message boards online about this as well. A Beka Academy Review by Ginger D.
Curriculum is good. Customer service is young adults answering the phone with memorized answers and very inflexible with making adjustments in this day and age of being customer focused. Start date for new school year is automatically 2 weeks out from order date and cannot be changed. Last year Abeka warehouse was so far behind in orders we started a month late. They make themselves look good for meeting deadlines. Issues / problems are yours and not theirs. I like the Christian teaching which is right on. The academy is legalistic so that bothers me. I noticed two teachers shared clothing on the videos. Same blazers and suit jackets shared. Christ wants your heart and loves you. He looks at the inward. Abeka looks at the outward too. Price is decent for the curriculum. Priced to force you to buy the whole year. Buffer between customer and higher ups that can alter or make overriding decisions (young trained staff) with rigid answers. My son started with assessments and streaming in the accredited program. There were so many unannounced pop quizzes and appendix quizzes. He was lost. It was so stressful. His grades plummeted. He didn’t know whether to study forward or backward in the material. We had to change to all paper and independent study. That helped some. At least I could show him which way to study. Now we know how the system works, it wouldn’t be as bad. 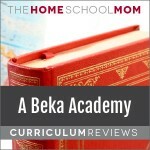 A Beka Academy Review by Kim N.
I’m a single mom and I work, so I opted for the DVD independent study from Abeka Academy along with a local enrichment program. This will be my third year using the curriculum and I am extremely pleased with the program. My son likes being in control of his day, though he has scheduled breaks and is required to complete that days lesson, if he chooses to work on Arithmetic and then Science he has that option. I feel confident he is receiving the best education he can because he is being taught by licensed teachers who know how to teach and present the material to accommodate different learning styles such as visual, audio, and repetition. The program is very creative in engaging the home students. As anything, you get out of it what you’re willing to put into it. If your child does not participate with the class as directed by the video teacher, they will be bored and their mind will wonder and they will not grasp the concept being taught in that lesson. However, if your child participates, they not only will have fun, but they will learn the lessons being taught. As a parent, if you do not check the daily assignments, quizzes, and tests then you will fail your child and not know they’re struggling with a specific concept. I feel this would be a great solution for families which do not feel confident in their ability to teach subjects outside of their strengths. A previous reviewer stated the DVDs did not work on a laptop/computer. I have not had that experience and we began in 2015-16 school year. They do offer a streaming solution, but I could not guarantee my child would always have internet access and therefore continue to opt for the DVD solution. The DVDs play on an older laptop running Vista as well as a newer one running Windows 10. One uses the free VLC Media player and the other uses a manufacture specific media player. The only challenge I have is determining which quizzes or tests are administered by the video and therefore handles the timing of the test. As we have progressed through the grades, the videos have edited out the duration of the quiz/test; however, it’s unclear as to the amount of time that is expected to allocate. This is not an issue if you do not plan to have your child participate in local standardized tests, but if you do then acclimating them to working within specified amount of time is for their good. It also seems the quizzes are often administered in the middle of the lesson and therefore requires the DVD to be paused. This requires the parent/home teacher to be more aware to ensure the child doesn’t get distracted while the DVD is paused. Wonderful teachers wonderful text books and definetily wonderful principles. The teachers also make you feel apart of the class. Anyone who thinks abeka is terrible dont care much for their kids because abeka not only teaches them to learn but most of all how to know Jesus personally but have a closer relationship with God. I know my kids are learning godly habits instead of the junk public schools teach our kids. I wouldn’t know what to do about my children’s education without abeka here to help! I have been homeschooled with the Abeka curriculum since the second grade and have been using the videos since about the fourth. There is a fair amount of homework and the lessons are just as long as a regular classes in school. The one major pitfall with doing school this way is there is no student, teacher contact; if you have a question, you can’t ask. I believe that this actually worked to MY benefit, because I then had to figure out how to solve that problem on my own by deduction and I now see the difference when I am among other individuals who ask immediate questions without thinking them through first. I had many memorable teachers over the years and hold the hilarious Mr. Howe (5th) and utterly amazing Mr. McBride (high school) in very high regards. I don’t really like science so, although I admit that the classes really are quite interesting, I still prefer to just read the the book and study some days. They drill you on everything and, if you are with the program for multiple years, you will learn songs associated with memorizing long lists that will never leave your memory. The constant quizzing and testing was annoying, at least, but it really kept you on your toes and gave you a reason to finish your homework accurately.The work can be long and tedious but, in the end, you learn everything with an accurate and Christian perspective. Throughout the years I earned mostly As and scored well above average on all of my standardized tests. As a junior I took two semesters of college composition and algebra at a community college and finished with an A+ in all of them. And I actually skipped the tenth grade, so the curriculum REALLY prepared me for those classes. My only regret is that I didn’t try hard enough to apply myself in everything because then no other K-12 education could surpass my own. This education curriculum is rigorous and requires discipline. If you want to try to succeed without those elements, then you are setting yourself up for failure. But do it right and you can’t really go wrong. A Beka is not for the weak or unmotivated student. The teachers and program are first class and challenging. Our child was able to score very well on the SAT and ACT and was offered scholarships to all the leading schools. I don’t understand how ABeka Academy gets such bad reviews. They are a quality homeschooling program with quality textbooks. The young people reviewing ABeka must all be lazy and not interested in excelling in their education. Yes, the DVD program may be a bit grueling to sit through, and a pupil could just as easily read the material and test on it without the help of the video teacher, but some states require accredited courses and will not accept non-accredited courses for graduation to satisfy state requirements. This is why my son will enroll with ABeka Academy when he is a 9th grader and complete the course through high school. I have homeschooled three young men using ABeka, and there is no finer curriculum – much less Christian curriculum around. Please everyone who is thinking about homeschooling NEVER DO IT i just went through a year at this abeka academy and you will regret doing it its not worth it send you kids to a public school i was literally mentally tortured it was awful so don’t do this ever. Cons: LITTLE TIME, A BIT TOO FAST. THEY TEACH WELL.READ BIBLE.SOMETIMES THEY ARE FUNNY AND MAKE YOU LAUGH.MY BEST TEACHER IS MRS. AUTREY.THEY SING HYMNS,THAT IS NICE TOO..
ALSO i dont recommend this program itts so boring like give a child some breathing room not 5 quiz and 2 test every week! I love the arithmetic teacher, Mr Howe. He can be pretty funny but the language video can be a bit boring at times. I’m planning to use it later on. My wife and I both work, and share teaching, which is why we opted for the DVD independent study from Abeka Academy. While our children generally like Abeka and we are satisfied with the content we ran into technical issues this year. We have used Abeka Academy from K through 7th grade, there are some great and memorable teachers, but now they have decided to start securing the discs, and as a result they no longer play on a computer. This is a serious problem for us, the flexibility of school anywhere with a laptop was part of why we choose Abeka Academy. Customer service tells us the DVDs are only designed to play on a dedicated DVD player (IE like the one connected to a TV to play a movie). For us this serious downgrade in technological capacity in 2016 by Abeka is making us rethink using them. This is our second year to use Abeka Academy and we absolutely love it. My kids are ahead of their peers in PS. The workload does increase some with each year. At first it takes some getting used to but you will find what works and what doesn’t as time goes on. We plan to continue using Abeka. A Beka Academy Review by Jessica H.
We started k5 with my daughter using dvds. She has learned so much this year. She enjoys school and loves to sing along with her class. She is always happy to share something new she has learned in her bible lesson. The dvds have really saved our homeschool. I felt so stretched thin having three children, chores, and church commitments. But the dvd program has taken a huge load off of me. I am still involved but the dvd teacher does the most time consuming part of homeschooling. I love the bible lessons and the phonics program is the best I have found. My only complaint is that the videos can feel a bit long at times. But you as the parent can modify as needed. I definitely recommend Abeka video classes. We have used this curriculum for the last three years exclusively and parts of it for a year prior. This past year we started using the streaming and love it. We love the conservative Bible based teaching. We even went to Florida on our spring break and met the teacher! I love Abeka Academy Accredited Program. My son loves his DVD teacher and can feel just like he is a part of the class from home. The Video teachers always interact with those watching. They have awesome curriculum and great customer service when I need. I have no complaints and will use through grade 12. A Beka Academy Review by Lisa R.
A Beka Academy has excellent customer service. Once in anger I hung up the phone on them, and a few weeks later, I apologized. They wholeheartedly and without reserve forgave me. They are always friendly and courteous on the phone. They bend over backwards in helping you. I am very impressed with A Beka Academy. A Beka Academy surpasses all the other homeschool programs available. I would not choose anything else for our two children. The Biblical worldview that is taught is excellent. The academics is excellent, and the teachers are excellent. Our two children, a girl and a boy, both have looked forward to the next homeschool year with excitement and enthusiasm. The teachers teach the Christian way of life in all their classes and discernment is taught as well. Our children have learned through A Beka Academy the evils of Communism and socialism and the democrat party as well as the goodness of capitalism and conservatism in politics. They have learned that our nation was founded by men of strength of character who upheld the Bible and founded our nation NOT on slavery, as the government teaches the children and college students today, but instead on the Word of God. Our children know that two wars could not be fought at the same time. The war against England had to be fought first and then the war against slavery. One war within and one war without at the same time would tear a nation apart. That is why the Revolutionary War was first. Our children know that the founding fathers-most of them- did not like slavery and wanted to get rid of it. Our children have scored 91% overall and 94% overall on the Iowa Test this year and last year they scored extremely high as well on the Stanford 10. In the accredited program, our daughter got straight A’s the last two years and earned honor roll. Our son, who is two years younger than her, has always earned mostly A’s , a B+ in the sciences or a B, and a B in his arithmetic/mathematics courses. As I said before, our children have always loved A Beka Academy and A Beka Academy accredited. We did use A Beka Book from first grade to the end of third grade with our daughter and kindergarten arithmetic to the end of 2nd grade with our son, and we found that a joy, too. I cannot say enough good things about A Beka, A Beka Academy, and A Beka Academy accredited. It is by far, the best. The first year of A Beka Academy our daughter even cried real tears because she did not want it to be over. She did not want to say good bye to the teachers she loved so much. I have two children, son started in 3rd grade, daughter in 5th grade, currently son is in 7th and daughter is in 9th and we are looking to “Graduate” with the A Beka program. My children love, bible, history, videos – English/Grammar is complete, difficult but if your child is up for a Challenge this is the place. Its complete and keeps them busy with school work and not dilly dally doing nothing/TV. The Bible lessons are out standing. Math for 4-6th grade is awesome, teachers keeps students laughing and learning! He’s great. My daughter went straight to Algebra in 8th grade and Algebra 2 for 9th grade. My son will do the same. Both children score two grades over on the annual SAT test we take, my daughter is scoring “POST HIGH SCHOOL” when she is in the 9th grade. So if you/ or yourr students are looking for a “Full” education with serious challenge, this is the place. Reciting the poems may seem silly but it will help with all around instruction, the scripture memory is amazing. If your child is struggling with spelling, it may seem tedious but having them write out the words (five times or more) is really the only way to go, in syllables if they have a possibility with dyslexia (that is how I had to teach my self) when the child sees another word in the word that will help as well. I really think spelling is also a brain maturing so it will come in time and boys are not geared toward spelling and writing is something they do not like usually as well, now everyone of us is different but that is how things have worked for us. When we have had questions, in Algebra or for a “Research report” we call the A Beka and they call us back the next day as we are on different time schedule then them, very helpful and very accommodating. We have been using them for five years, we thought this to be just a trial thing but with the success we have had we are staying. I do wish there was some way to meet other “A Beka” home-schoolers in the area if a “Convention” was something they did annually in the different areas of the states or just one big one. I graduated 2 girls with A Beka DVD and though they loved most of the teachers both cheated since the work was so rigorous and immense. Sigh! I wish back then I knew someone else who used it or had a computer with reviews! Yes that was back in the ‘no computers, no cell phones’ age. Fast forward to our second family of 2 boys and finally I got smart. I completely cut my sons penmanship, spelling, and poetry memorization out of his curriculum. Funny that my 27 and 25 y.o. girls still to this day are horrid at spelling and my son came home this year with solid A+ spelling tests. This was his first year out of the home (7th gr) but we’re going back to A Beka since the Christian school uses secular curriculum. I love the great ideas that I’ve heard here for adapting and I’m definitely using some of them! BTW my son loved the interaction with real teachers & students at “group school” but he says he can’t stand the books and is looking forward to the good A Beka curriculum next year. We enrolled my DD, on 10th grade second semester, We chosed her courses, Abeka emailed us ,they need to make some adjustments on our daughter’s courses. Abeka made a mistakes choosing her courses, Abeka enrolled her 1 years behind her grade level. Abeka enrolled our daughter on the courses that she had taken and had received a credit already. It was a nightmare experienced for us, We have been calling them almost every week to fix the problem. Abeka’s customer service and personnel are so unprofessional, our ordeal was a long story, finally we got a letter from Abeka stating, Our daughter has to changed her courses due to the fact that She was enrolled in Algebra 1, History, English and other courses that she had received a credit already, It took 10 months for our daughter to finish one semester. Abeka had changed our daughter’s course 4 times. They realized they had made several mistakes.The damaged that Abeka has done to our daughters academic is irreversible, She was an honor student in her previous Private school, She will be graduating 1 year behind her age group as a result of Abekas Irresponsibilities.We transferred her in a prestigious college University with high school program paying $1300 a month. I would like it to be known at how disappointed and disgusted I am with the A Beka Academy Christian homeschool program. My daughter is currently enrolled and using the video streaming lessons. She watched 3 of her lessons today (lesson 39) then shut the computer off to take a small break. At today’s point she should be watching lesson 39 in all classes. When she logged back on, her classes set her as far as lesson 21. She was very close to taking her 9 weeks exams and was supposed to be preparing for them. I called the Academy and spoke with M**** in technical support. She informed me that “it must be you computer because we don’t have a system error and we can’t do anything about it”. I then told her that I wanted a penalty taken off my account for a late progress report because she is now behind almost 20 lessons and, again, M**** was unable to “do anything about it”. I pay over $800 for this service and it sets her back almost 20 lessons, and there’s “nothing” the Academy can do about it. Is this some type of scheme to make more money with late progress reports? I can assure you that after this year, we will not be using A Beka Academy again for our choice as a homeschooled program due to a system problem that the system itself cannot fix. I have used a beka for all 12 years. Every year it seems I have an issue at some point with customer service, however I have continued to use them because I know that their curriculum works for my children. With that being said I am now at the point where my oldest is ready to graduate. As a family we had planned on going to Pensacola so that he could attend the graduation ceremony. 5 months before graduation we are sent the very strict dress requirement. Our son has long hair and has had long hair for a few years. Due to his long hair he is not allowed to participate in the ceremony. I refuse to make my son cut his hair because a beka demands him to. This breaks my heart as I feel every parent wants to see their child walk across that stage. How does a “christian” school judge someone by their appearance? We teach our kids not to conform to society but a beka expects them to conform to their expectations. 1. Before doing this, I was teaching 4 kids all day long. I could not get the cooking done, the laundry, grocery shopping, or even a shower many days before. Although I was picking the best curriculum before, I was unable to execute it well with all my kids and all it takes to keep a house going. 2. I feel like my role changed from being the teacher to being their cheerleader and encourager. This is HUGE! If they are struggling to understand a lesson, I no longer have to re teach it. I simply can look at where they are getting confused and aid them. Their teacher will review day after day after day so the pressure is not on be to get them to understand. 3. My kids are getting a better education. The other day the phone rang and someone from church was in a crisis situation and needed to talk for 20 minutes. Before this, I would have NEVER thought about picking up the phone during a school day because everything STOPS when mom can’t be there. Well, I answered the phone and as this person was talking I realized school did not come to a halt with someone else needing me. They were still doing their lessons, they were still being taught. I was overwhelmed with this as most homeschool moms know, if you take a phone call and you are the teacher the day stops until you are back with them. 4. This curriculum has made my kids very self governing. They have initiative now. They don’t have to wait for me to get them going. I can be making my bed, brushing my teeth and my kids are in their areas doing their history. Has nothing to do with me. This was a shock to me as I have been used to having to get everyone seated to get them going. 5. The kids actually like it! They think it is interesting. Of course there are times when they say “I don’t want to do school” but there were times they said that before. I am not stressed so I am able to come along side them and encourage them to do their best. They push through in those times and gain character. This happens for any curriculum though and I would say it is rare. 6. If you are going to do this, I would give yourself a month learning curve. Be prepared to do nothing but help them for a few weeks get accustomed to this. It is like starting a new school. Any change takes a bit of time to get used to so be prepared to give it a few weeks to help them a bit extra. 7. There have been a few times, maybe 3 that I can think of. That I have had to talk to a child about letting their mind wonder or working on seat work while the teacher is talking. The way I can tell they are doing this is if I am checking work and I am starting to notice 3 or 4 bad grades in a row. I will simply talk to them and ask if they are listening. Again, I am able to talk to them as this is my new role. The cheerleader or the encourager instead of the teacher. I love this!! So much better on our family. 8. My kids like to do their Bible at night before bed. It makes their school day shorter. When it is bed time, the older kids like to go do their Bible and then go to bed. I like this for them as well. 9. I always tell my kids, if they need a break, take it. Usually they like to do 2 subjects and set their timer on their watch for a 20 or 30 minute break to play outside, or do something. I never let them have free time on electronics during the school day as I explain they are already on the computer for a long time, they don’t need any more. It took a few days and now they never ask. 10. I feel like a mom and a wife again. We are called to be more than teach them everything academically. I could not do everything and I tried for years. I thank God almost every single day for this. I will hear my kids studying geography or math or science and think, I didn’t know they were learning about that. And then realize how wonderful it is that I don’t have to have my mind fried over every single detail of their education. 11. This is worth every penny. Again, I don’t write reviews for anything. I am taking the time to do this knowing that we homeschool moms can be frazzled in our homes and trying to do too much. This is a gift from the Lord for your home if you can relate! We do video streaming and it’s very convenient when Internet works. Never had any problems with buying stuff from them, but I really needed the accreditation, so I turned the work in and when I call them about the grades they tell me they had my permission not to grade them. Very unhappy with them will research for different school. Over all I really like the program. This is our third year homeschooling and I was feeling stressed, being pulled in different directions, and felt like I was “missing” things trying to put everything together myself to teach 2 boys. This is our first year using the A Beka Video program and we are doing the accredited version. I needed to hold myself accountable and make sure my boys were really learning everything they needed to be learning and after reviewing this curriculum I felt it would be a good fit for our situation. I actually like the rigorousness and longer day in order for us to complete all of the material. The extra work sheets and video’s really explain the material in a way that my kids get it. Maybe it’s not “fun” or “relaxed” but I take teaching and learning seriously and I want my boys to as well. Before A Beka they had already learned how to negotiate shorter school days and fuss about certain subjects to try and get out of doing them completely or correctly. My oldest son hates to write and I found myself giving him less writing assignments just to avoid the conflict. A Beka gives us more structure and holds us accountable. He now knows what is required and gets his work done. My only complaint would be that some of the video segments show the children in the class room interacting with the teacher doing various math and reading exercises and my youngest feels left out. Sometimes after the lesson is introduced we turn the video’s off and use that time to work together doing similar exercises to practice the concepts. I have lots of extra manipulatives so it’s not hard to jump in and take over. I very much enjoy working at home with my children helping them to learn and with a little tweaking A Beka has allowed me to do this in a manner that I am confident with. Abeka has it all. They leave nothing out. We use the DVD Abeka Academy and to me it’s priced reasonably for all they provide and considering what private school would cost. Both my husband and I work outside the home and this program is so well laid out that it allows him and I or any other person how has to run school for us to never miss a beat. It really boggles me how people complain about how long it takes to school your kid with this method because it takes us about 2.5 (4th grade) -4.5(7th/9th grade) depending upon the child’s enthusiam for a particular lesson. We augment the scheduling and homework/seatwork to fit our child’s needs. Yes it requires that I check and give quizzes, test and such, but that’s realistically what kids have to do if they decide to apply for a job or go to college. My kids are not bored by the videos – not anymore than they would be if they were in school (up til last year they were in public/private schools and are used to that environment.) Now, in addition to using the full Abeka DVD based curriculum, my kids who are used to a traditional school day have ask to add on other subjects to their day and even so they are finished in about 6 hrs tops. As for the cons: the fact that the curriculum is limited to workbooks and videos may not appeal to all types of learners. So why the dvd teacher is doing the drills and review with the students, I put my son on xtramath.com or teaching textbooks. It gives him a break. However, I have tried many other curriculum and they just never seemed as complete or thorough as Abeka especially when I look at the detailed curriculum on thier website and compare it to others I’ve tried. Lastly, my kids who enjoy structure and the traditional school model request this curriculum time and time again – so that says it all. Cons: "It can be tough, in lots of ways"
Wow between me and my two children, I have been exposed to ABeka now for all grades except, 1, 2, and 11. I went to Christian Schools that used only ABeka and we loved it as a school. My mother used ABeka for High School in her own Video School, she loved it as did I . I personally returned to public ed. for 11th. hated every minute of it. I graduated from ABeka with a Diploma, and was able to wake up late, do my lessons and go to work my senior year, not having to be up at the crack of dawn was the best part, with my life at the time!!! I had to work until midnight most nights. I did prek with my daughter, it was good, K5 with my son, it was ok. and now 6th. with my daughter this past year, it was good but we had to move several states to and from and relocate for 6 weeks temporarily for work in a hotel and it made it very difficult….. The DVDs can loose your attention at times but still are quite good, in teaching the lessons, and there is tons of work to be done, makes it kind of stressful…..Hoping to do 7th. independently with her this year, and 12, accredited with my son. I have 2 boys and 2 girls. I have used the traditional approach, DVDs, and online streaming. I have been home schooling for several years. Both my boys learned to read very quickly, and now have a love of reading. My 5th grade son loves the math drills and always is able to do the speed drills very quickly. I started with the traditional Abeka program and used it fully. LOVE the traditional! We switched to streaming but found that we didn’t always have a good enough Internet connection since we were traveling. We then switched to the DVDs. I have to say that the DVDs are too boring for a home school setting. Both of my boys have lost interest in learning with this method and its hard to keep them working unless i badger them. This isnt the relationship i want with them. We have tried two years of DVDs and streaming combined. This will be our last year with Abeka for the boys unless they come up with a better solution. I’d go back to the traditional, but I want an accredited homeschool curriculum and above 5th grade you have to use the videos to get their accredidation. We used the traditional program, not the DVD program. The lesson plans were straightforward, however it became too demanding to keep up with all the worksheets. We ended up only doing the worksheets that were required for submission to Abeka. It was difficult to do the reading by phone assignments and beat the 2 minute timer. The phonics learning is a great foundation for reading. It was our first year of homeschooling and the ABeka Academy was a good start. We have learned a lot. This program basically recreates a classroom in your home through the use of DVD’s which you’re required to watch. The books and workbooks are all really colorful, interesting and full of information. The teacher is really amazing and she does a good job at remembering the “boys and girls at home”. My son absolutely loves Bible class lessons and I like the mix of fun songs, hymns, and patriotic songs that they learn. I’m really impressed with the Language Arts program. My son really likes to read the stories and they teach wonderful Christian values. That being said, it’s not the same as having real feedback. The problems we encountered were with the dvd’s and being required to watch them in order to be part of the academy. To put it simply, our child was very passive with the instruction on the dvd’s and required constant reminders and participation on my part in order to pay attention and follow along with the class drills/activities. He normally doesn’t have a problem paying attention, but even when his little sister and I participated with him, he’d get bored and lose his focus. It was also very frustrating for him to not be able to keep up with the math drills. It is a very rigid program and it takes a full school day to watch all of the dvd sections and complete the work. This, unfortunately, does not leave any room for any modification or personalization of any kind. By the time the required work was completed, my child had no desire to do anything even remotely related to learning. In order to fix the problems, we started using the materials as strictly a resource and made some changes. We now watch the Bible section, participate in the Spelling/Phonics practices as needed, fast forward through the Math drills/games to where the teacher is introducing new material, do our Seatwork and Reading on our own, and either participate in the Activity Section or do it on our own. We’ve also shaved off some of the busy work. This has left time to practice math drills and other skills at our own pace and to do our own enrichment activities. We’re all much happier with the modifications and our son still likes school. We don’t plan to enroll in the academy program again, because of the DVD requirement, but next year we’re planning to get the Language Arts and Bible DVD combination and use other curriculum for Math, Science, etc. We also plan to use their materials for our daughter’s Kindergarten. Having the freedom and flexibility needed to meet your own child’s individual abilities/interests is part of training up our children in the way that they (specifically) should go. It was a great curriculum to start with since I didn’t know anything about homeschooling, but my son was very bored with it, he hated having to sit down and watch his lessons, he could’t keep up with the numbers portion, and participation was a little low. However, on the flip side, he did learn how to write in cursive by age 5 and he learned all his alphabet and reading. He still struggles with reading though because he was just memorizing everything for the lesson and not really retaining anything for the longevity. We love the systematic approach A Beka takes with mat. I like that the concepts are easy to introduce and it’s easy for me to grade even without the teacher’s editions.